Chocolate Ginger Cookies - Pretty. Simple. Sweet. 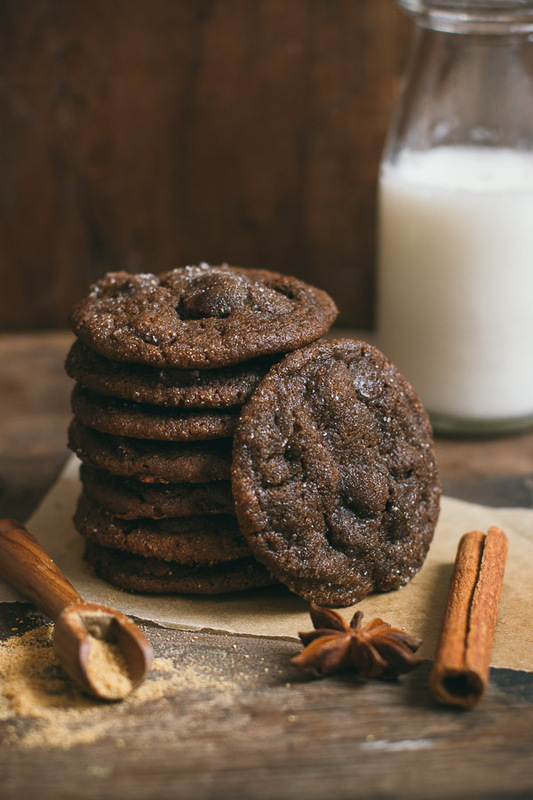 The combination of ginger and chocolate in these spicy, chewy, gooey cookies is simply heavenly and especially perfect for the holidays! Who knew that chocolate and ginger were such great buddies? I didn’t—at least not until I tried these cookies. Surprisingly delicious, they’ve become a favorite of mine, and I make them every time I have fresh ginger on hand. 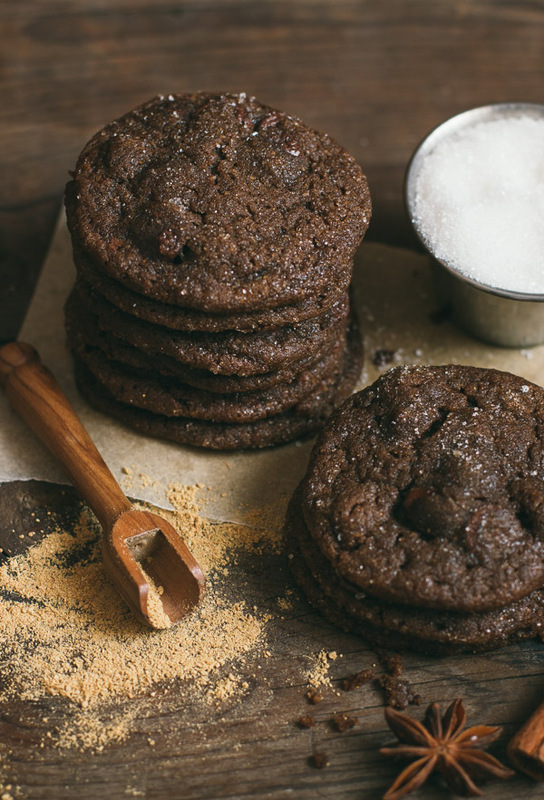 The base is a classic ginger cookie with molasses, brown sugar, and spices and no eggs. Then there’s the addition of cocoa and chocolate which is what really takes them to the next level. 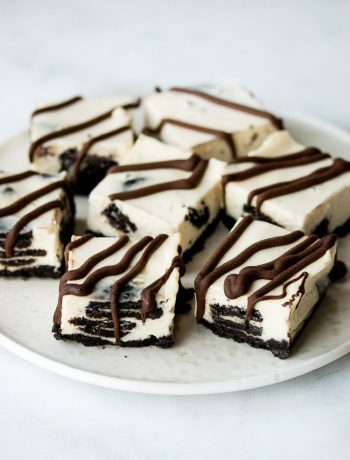 There’s plenty of spice and melted chocolate in every single bite. These cookies are also super soft and chewy with a slight crunch from the sugar coating. A combination of fresh and ground ginger gives these cookies their intense flavor, along with the addition of other spices like cinnamon, cloves, and nutmeg. Can I skip the fresh ginger? You could, and the cookies would still be good, but they wouldn’t taste quite as great as if you followed the original recipe. There’s a whole tablespoon of fresh ginger in this recipe, so replacing it with more ground ginger would ultimately yield a different taste. I like to use my microplane grater for that. You know I give you shortcuts whenever I can, right? Trust me, I’m a lazy lady. But if you bake these cookies right away, they’ll spread out so much during baking that you’ll end up with one giant flat cookie. Two hours are the minimum time recommended for chilling, plus 20 minutes after shaping the dough into balls, but I recommend even more. I like to prepare the cookie dough quickly in the evening and bake it first thing in the morning, then eat about six of the cookies before anyone gets home. 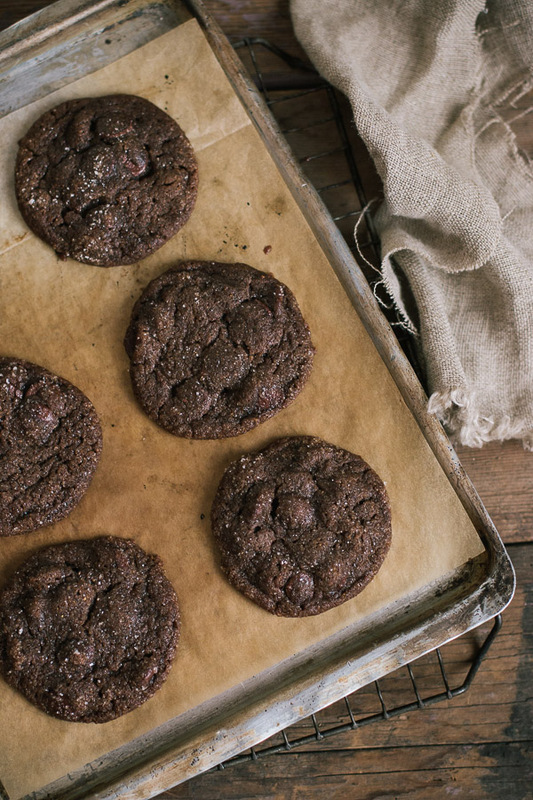 Overbaking can make the cookies tough, and the best thing about them is their chewy texture. Because of their dark color, it’s hard to know when they’re ready, but just don’t be tempted to bake them for more than 12 minutes. And one last thing. Try these as sandwich cookies. With vanilla ice cream. You’ll die from pleasure. 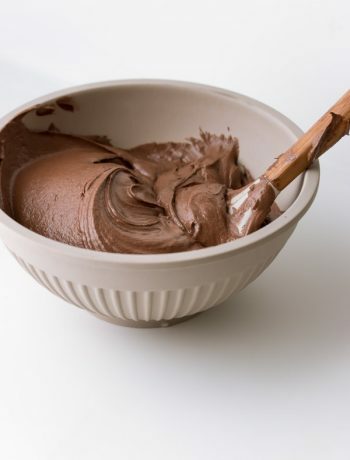 In a medium bowl sift together flour, ground ginger, cinnamon, cloves, nutmeg, and cocoa. Set aside. In the bowl of an electric mixer fitted with the paddle attachment, beat butter and fresh ginger on medium speed until whitened, about 4 minutes. Add brown sugar and beat until well combined. Add the molasses and beat until combined. In a small bowl, dissolve baking soda in boiling water. Add half of the flour mixture to the butter mixture then beat in baking soda mixture. Beat in remaining flour mixture. Mix in chocolate just until combined. Don’t overmix. Cover bowl with plastic wrap and refrigerate until firm, at least 2 hours or overnight. Preheat oven to 325F/160C. Roll dough into 1½-inch (3cm) balls (I like to use this medium cookie scoop for that) and place 2 inches apart on baking sheets. Refrigerate for 20 minutes, then roll each ball in granulated sugar. Bake until surfaces just begin to crack, 10 to 12 minutes, rotating the pan halfway through. Let cool 5 minutes. Transfer to a wire rack to cool completely. Cookies are best the same day they are made, but can be stored in airtight containers at room temperature for up to 5 days. Q: the unsulfured molasses is in liquid or solid form? I can’t wait to try these! They look fantastic 🙂 I bet they are amazing with vanilla ice cream just like you suggested! These cookies are gorgeous, Shiran! Love the spices mixed with the chocolate. These cookies make the perfect autumn treat! Wow! And they’re spicy too? This recipe sounds fantastic, love it! Sounds interesting! I think I could handle the heat 🙂 I’m glad you enjoyed it! I made these for our office holiday bake-off and they were a hit! I added a little fine-chopped candied ginger with the chocolate chunks, and I did put about 1/4 teaspoon of salt in the dry ingredients, and they came out fantastically. Moist and chewy and so flavorful. Thank you for sharing the recipe! Thank you so much for your comment, Angela! I hope you have a good holiday! I haven’t tried it with honey, but the two are different in flavor, and the molasses gives it its unique flavor. Sounds delicious! Could I use unsulphured blackstrap molasses? That’s all the shop I go to has. I understand that blackstrap means the molasses have been processed further, just opened a jar, they are really thick! Thanks! Hi Jacqueline, blackstrap molasses has a stronger, less sweet taste, and the cookies can have a bitter flavor. I don’t recommend using it, but it’s a matter of personal taste. After chopping up all my 90% dark chocolate Lindt bars (almost no sugar), I realized maybe you meant sweetened dark chocolate. If the dark chocolate should have been sweetened, can I add brown sugar to compensate? Hi Anita, 90% would be bitter, unless you try it and like the flavor. I usually suggest up to 70% when baking. Adding sugar at this point would ruin the cookie texture. You can taste the cookie dough and see if you like it. If it tastes good, you can add more chocolate that’s sweeter, like milk chocolate, and bake them anyway. 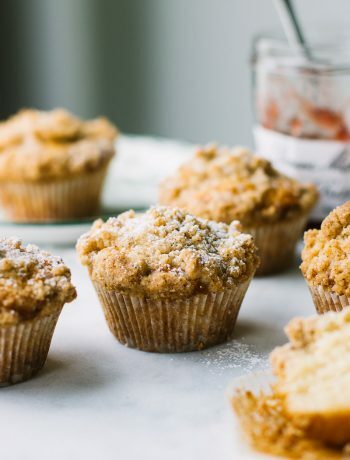 Any recommendations for substituting with gluten free flour? Hi Elliott, I don’t have a lot of experience with gluten free flour but usually you can substitute all-purpose gluten-free flour in place of all-purpose flour at a ratio of 1:1, but my guess is that you’ll also need to add xanthan gum. Hi Shiran, in response to Elliott the ratio of gluten free to all purpose flour is 1:1 by weight, not volume. In my experience, rather than xanthan gum (which gives a somewhat ‘gritty’ mouth feel) using sweet rice flour a.k.a. mochiko as about 15-20% of the total gluten free flour weight gives the baked goods the ‘glutinous’ chewy texture without the grit. There are some gluten free flours that are the same weight and volume as a/p flour but I have no experience with them as I mix my own. Hope that helps. I’ve had the same questions about Stewart’s recipe, which is all over the Internet – why no eggs? I’ve added a yolk and it’s always seemed fine. I don’t know, I’m leery of cookies without the ingredients I expect, I guess. Do you think it works well for a particular reason sans eggs?